Purpose built Naval Air Station on site of former WW1 Royal Naval Air Service station. 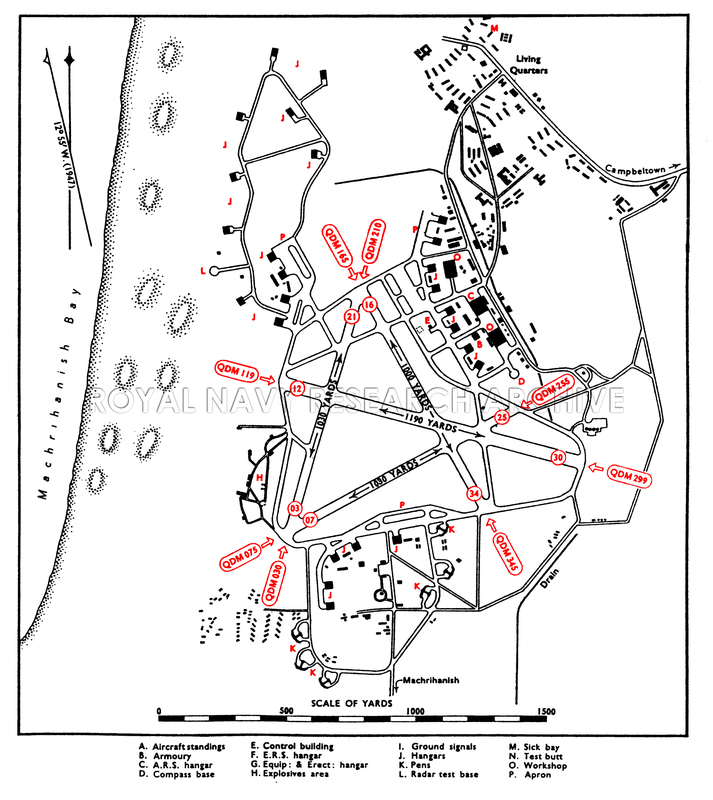 (1)16 April 946 to C & M.
(2) 30 September 1952 to C & M.
Transferred to RAF and developed as a NATO base. All-weather airfield, with facilities for B.E.A.C. daily throughout the year and at one hour's notice day and night for Civil Air Ambulance. Flying training - First Line A/S squadrons, Pilot's refresher course. 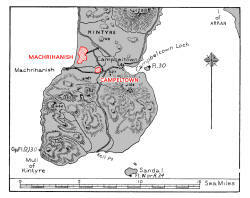 The airfield is situated on the western side of Kintyre, 9 miles NNE,. of the Mull of Kintyre and 1¼ miles NE. 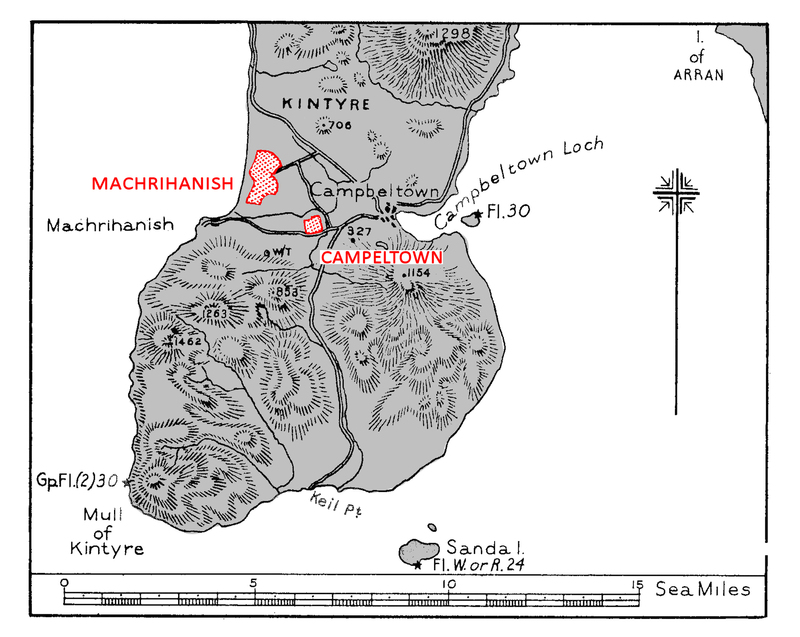 of the coastal village of Machrihanish. The Mull of Kintyre. Campeltown Loch with the town of the same name at its head. Access to the main road running SE. to Campeltown 4½ miles (R) where there is a small harbour and pier with a depth of 12' alongside. No rail communication. Bus service between Campeltpwn and Glasgow. Alternatively bus Campeltpwn to Tarbert, thence by steamer to Wemyss Bay and rail to Glasgow. B.E. Airways to Renfrew (Glasgow)). Control building inside the perimeter track on the NE. side of the landing area. Mountainous country to N. and S. with sunnit (1462') 6 miles SSW. Hills (706') 1¾ miles NE. and (835') 2½ miles S.
W/T masts on hill (334') 2 miles S.
Windsocks on the R. side of the landing area inside perimeter track. 2 transmitters, 2 receivers, 1 Transceiver*. Officers and ratings living quarters on he NE. side of the airfield. Note: Accommodation figures are those at time of reduction to C. M . and are on war-time austerity scales. 6 large double pens at the S. extreme of the airfield and connected by 35' tracks to the perimeter track. On the E., S. and W. sides of the landing area. Sick Bay situated NW. of airfield near entrance to station. Sick quarters in living quarters on he NE. side of the airfield. Office in Control building. 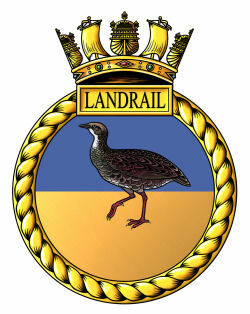 Limited service by Naval personnel. 99.000 gallons (100 Octane) in Campeltown installation. 77,000 gallons (100 Octane) in Machrihanish installations. 12,000 gallons (80 Octane) in Machrihanish installations. 8,ooo gallons in two installations. A/c radar base on W. side of N. hangar area. On apron near Control building, for 6 aircraft. Information taken from B.R. 1807. 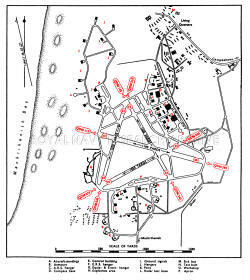 Admiralty Handbook of Naval Air Stations (Home & Abroad) Dec. 48 and amendment March 1952. Sub unit of 700 squadron. Equipped with 6 Walrus and 4 Swordfish. Equipment included Firefly, Fulmar, Corsair and other assorted aircraft types. Operated a mix of aircraft types: Swordfish, Skua, Roc, Chesapeake. Martinet, Fulmar, Reliant.